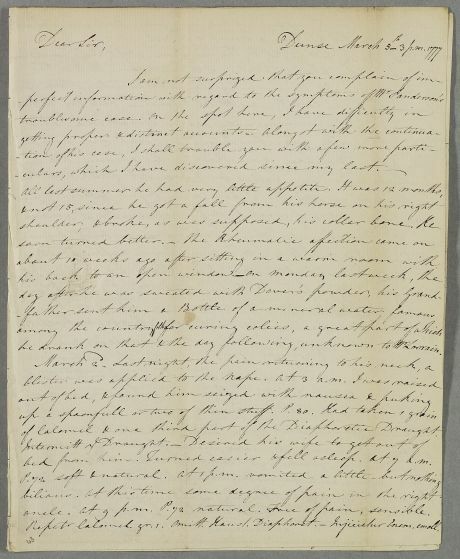 Letter from James Hall concerning the case of Mr. Robert Sanderson who became delirious and furious from the agonies of a severe headache after not heeding Hall's advice. 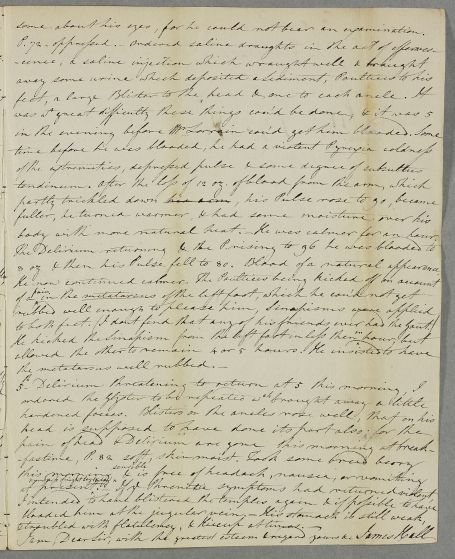 Postscript mentions Sanderson's brother-in-law, John Davidson of Ravelrigg. 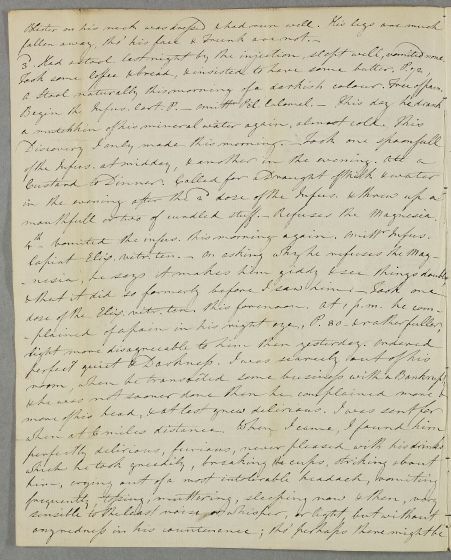 Summary Letter from James Hall concerning the case of Mr. Robert Sanderson who became delirious and furious from the agonies of a severe headache after not heeding Hall's advice. 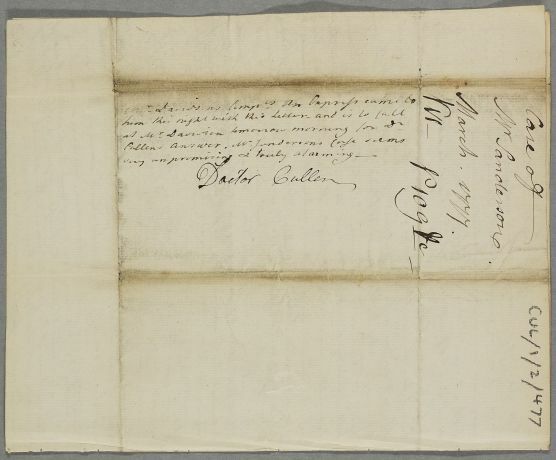 Postscript mentions Sanderson's brother-in-law, John Davidson of Ravelrigg. Case of Robert Sanderson who has a stiff neck and urinary problems. he drank on that & the day following, unknown to Mr Lorrain. of Calomel & one third part of the Diaphoretic Draught. bed from him. Turned easier & fell asleep. At 7 a.m.
pulse 72 soft & natural. Free of pain, sensible. 3d - Had a stool last night by the injection, slept well, vomited none. a stool naturally this morning of a darkish colour. Free of pain. mouthfull or two of curdled stuff. - refuses the Magnesia. some about his eyes, for he could not bear an examination. body with more natural heat. - He was calmer for an hour. 8 oz & then his Pulse fell to 80. Blood of a natural appearance. I am, Dear Sir, with the greatest esteem & regard yours &c.
1: 'Repeated the one grain of Calomel, ommitted the draught of Diaphoretic; [unclear] the emolient injection'. 2: 'Ommited the Calomel pills...'. P. 72 soft & natural. Free of pain, sensible. 4th - Vomited the infus. this morning again. Omittr Infus.